From left: Stan Fawcett, Remko Van Hoek, Laura Birou and Ben Hazen. 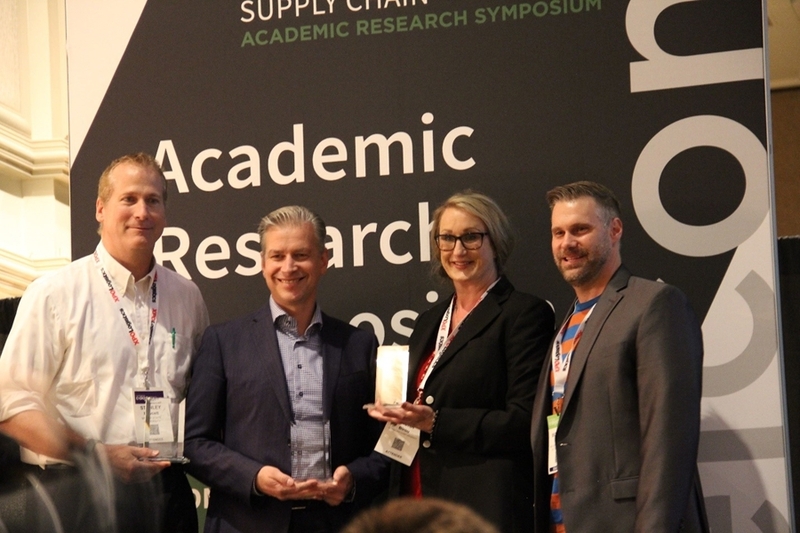 Remko Van Hoek, clinical professor of supply chain management at the Sam M. Walton College of Business, and co-authors Laura Birou and Stan Fawcett received the Grosvenor Plowman Best Paper Award from the Council of Supply Chain Management Professionals. Their paper, "Don't Build a Bridge to Nowhere: Triangulating Gaps in the Path to Successful Supplier Enabled Innovation," discusses the interrupted connections between innovation and implementation. Ben Hazen, chairman of the Academic Research Symposium, presented the award to the three on Sept. 30 during the CSCMP Edge 2018 Conference in Nashville, Tennessee. Van Hoek joined the Walton College Department of Supply Chain Management in January 2018. He teaches courses on supply chain management to junior and senior undergraduates and sourcing and procurement courses to full-time and executive MBA students. Birou is the founder of Birou and Company and a former professor. Fawcett holds the Endowed Chair of Global Supply Chain Management at Weber State University.